Editor’s note: St. Nicholas’ Episcopal Church in Tahoe City has been sold. We enjoyed going to church there — outdoors in summer and at Christmas — and our son went to their Camp Noel Porter. A previous post from Christmas 2015 is here. “After a lengthy process of discernment stretching back years, in December 2018 the Board of Trustees authorized the listing of Camp Noel Porter property for sale. We have accepted an offer from a Christian organization whose stated purpose is to use the property for long term ministry/camps and God’s purpose. The Outdoor Chapel will remain in use and well cared for by this faithful organization. “Previous offers and negotiations did not result in assurances the property would continue to be used as a Christian camp. This sale offers us the opportunity for this property to continue as a Christian camp to the glory of God. The Standing Committee, the Board of Trustees, and Bishop Beisner believe this is the best decision for our diocese at this time. 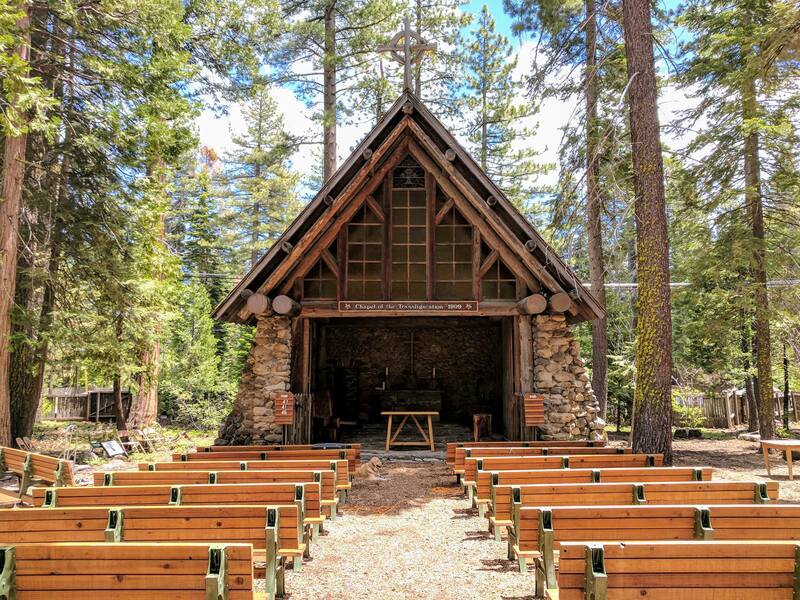 “The recorded history of the Episcopal Church in Tahoe City starts July 27, 1900 when The Very Reverend Edgar J Lion of the Diocese of California baptized two children and organized a Sunday School. “Built on 2 acres of land donated by the Bliss family, also owners and managers of the nearby hotel, the Tahoe Tavern, the Reverend Charles N. Lathrop of San Francisco was the first clergy-in-charge.